Critics Say 'Clunkers' Program Isn't Very Green The "cash for clunkers" program was designed to move new cars off the lots, and so far it's working. But it was also supposed to help the environment by replacing gas guzzlers with more fuel-efficient vehicles. Critics say it isn't creating a market for the most fuel-efficient cars. Are we being fully informed about the costs and downsides of green behavior? Dealers wasted no time in putting cars out of commission for the "cash for clunkers" program. This 1994 Ford Crown Victoria, at a dealership in Gaithersburg, Md., was "decommissioned" within 48 hours of the time it was turned in. 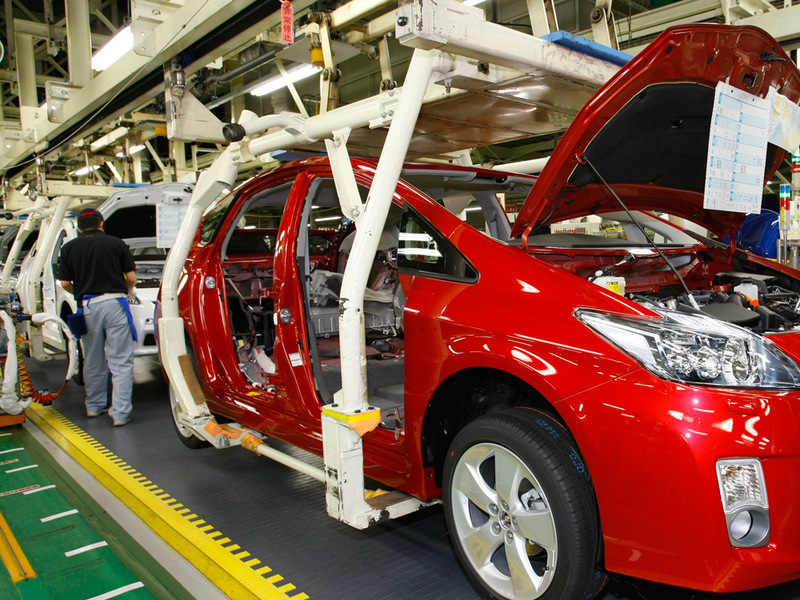 Toyota workers assemble parts on a new Prius hybrid in Japan in June. Environmental experts say that between 3 and 12 tons of C02 are produced for every new car. This is the first story in a series called How Green Is It? that will air throughout August on All Things Considered. The series examines some of the things Americans are doing — and buying — to help the environment and whether those steps really are as "green" as they seem. The "cash for clunkers" program was designed to move new cars off the lots, and so far it's working. But it was also supposed to help the environment by replacing gas guzzlers with more fuel-efficient vehicles. Whether that's working is another story. Robert Hemsley was one of the first customers to take advantage of the deals offered at Sheehy Auto Stores in Annapolis, Md. Hemsley says he wasn't thinking about the environment when he went to the showroom — it was finances: "Just saving money, stayin' alive, making a buck, paying my bills." Hemsley traded a 12-year-old Chevy van that got 14 miles a gallon for a Nissan Cube that gets 30 mpg on the highway. He says he'll cut his gas costs by almost two-thirds. But even before Hemsley drove out of the lot, his new car had actually added carbon dioxide to the atmosphere. That's because it takes electricity to make a new car, and fuel to ship it. "The estimates vary, but somewhere between 3 and, say, 12 tons of CO2 are produced for every car you make," says William Chameides, dean of the Nicholas School of the Environment at Duke University. Chameides calculates that if you trade in an 18 mpg clunker for a 22 mpg new car (22 miles per gallon is the minimum mileage allowed for a new car under the program), it would take five and a half years of typical driving to offset the new car's carbon footprint. With trucks, it might take eight or nine years, he says. Of course, the bigger the mileage improvement from your old car to the new one, the more gas you save and the faster you work off the new car's carbon footprint. If you trade in a 20 mpg car for a Prius that gets about 48 mpg, it saves so much gas that you can offset the Prius' footprint in about a year and a half. (But a 20 mpg car doesn't qualify as a clunker, so there's no government voucher). And people with big cars tend to buy new cars that are still pretty large, according to Brand Fowler, vice president of Sheehy Auto. He says more customers are opting for modest trade-ups, close to the four mile-per-gallon minimum improvement that's required for cars. Auto analysts say they're seeing plenty of deals for new cars that get 10 miles a gallon more. So far, though, there's not much data to indicate where the final average will end up. But either way, it's not enough, says Dan Becker of the Safe Climate Campaign. "The problem is the auto industry hijacked this law so it doesn't get the better ones on the road," he says. 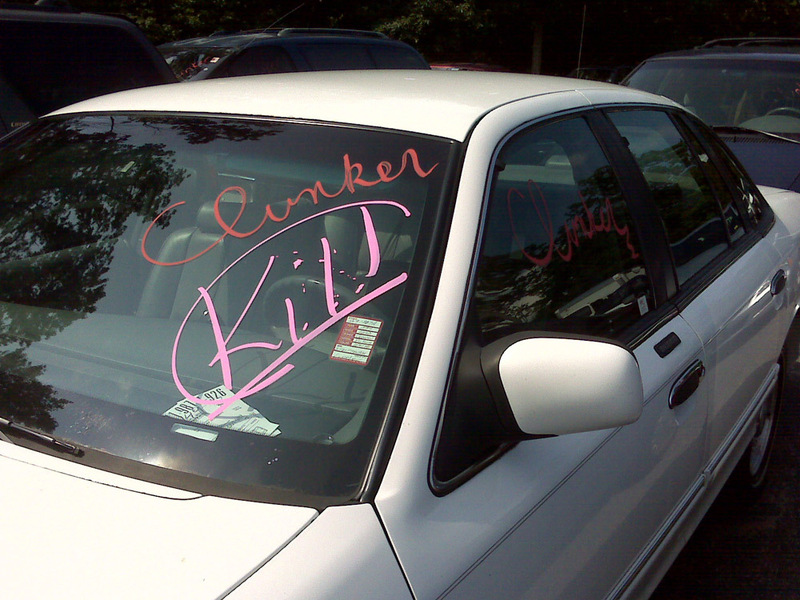 "All it does is replace old clunkers with new clunkers." Becker says the "cash for clunkers" program isn't creating a market for the most fuel-efficient cars. He notes that the original legislation had tougher mileage requirements and says the government would have done better by subsidizing people who buy cars that are 25 percent more fuel-efficient than the kind they're driving now. Even SUVs would qualify. Environmental analysts point out that only two years from now, new cars are supposed to get, on average, 27 miles per gallon. That's five more than required by the cash for clunkers program.